Had the urge to bake cookies today! I used our usual Thumbdrop Cookie Recipe (below) but swapped out the almond extract for two teaspoons of lemon extract, and filled the cookies with blackberry jam. They’re very tasty, and imagine they’d be really nice with ‘afternoon tea’ or the like, as they are somewhat delicate in flavor with that burst of berry. Happy Friday! Mix oleo and sugar till well blended, add eggs, mix well. Add extract. In separate bowl mix flour, baking powder, and salt. Add to margarine mixture, mix well. Roll into small balls on a greased baking sheet. 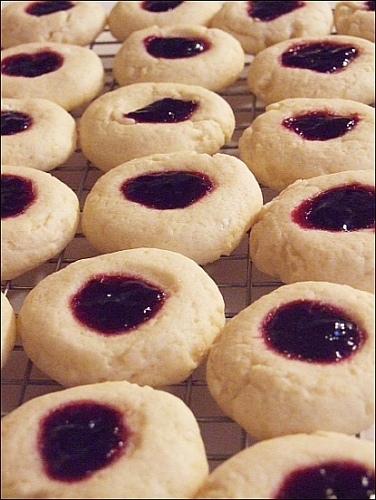 Put finger into center of cookie and put in jelly or jam as desired to fill hole. Bake 350 degrees 10-12 minutes or until done.